I've hardly done any carp fishing this year. To tell the truth I took Ben (my grandson aged 8) a couple of times and it was so slow that he was put off carp for the moment - hence I haven't bothered. Anyway, this week I had a spare hour one afternoon and so I bought a small, farmhouse loaf, ate a couple of slices, chopped the rest into 'matchbox sized' cubes and set off for the lakes. It was a dull, overcast, calm afternoon and when I arrived there were only two or three boily drowners at work, camped beside their buzzer bars and two rod setups. I set off to walk round the lakes and look for any sign of life. It wasn't until I reached the far end of the biggest lake that I noticed anything and then it was just a brief 'slurping' under some overhanging sedge plants. I assumed that it was a carp and dropped a few of my crust cubes into the margin. The slight breeze was blowing towards me and pushed the crusts right into the vegetation. I baited up and waited. After about ten minutes there was a gloop and one of the crusts disappeared so I tried to drop mine in the same spot. This was the tricky bit! The sedge hedge was so dense that it was extremely hard to poke the rod tip through. Then the line refused to run out (caught on leaves) and it was only after losing two crusts, shaken off in my endeavours) that I managed to lower one (I hoped - I couldn't actually see) onto the water surface. I laid down the rod, closed the bale arm of the reel and waited. Not too long (although it always seems like an age and I find myself going blue by inadvertently holding my breath) before the rod tip crashed over and I found myself playing a carp. The fish did not career away but decided to swim in large circles under the rod. There must have been at least five minutes of this circling, with the line periodically catching on weed stems and cutting through them, before I saw a big tail swirl at the surface. A couple more minutes of heavy pressure and the fish was ready for the net. For once it slid neatly in and I lifted it from the water. 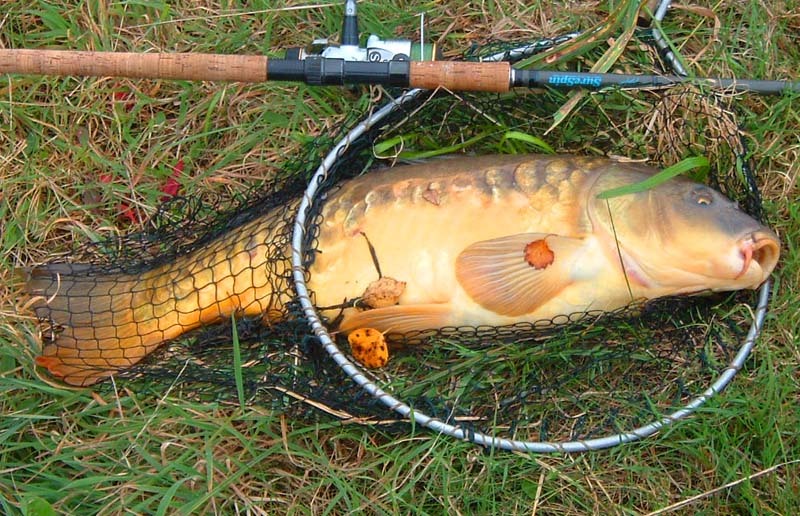 A very fat carp pushing twenty pounds - excellent! I was so pleased with my carp that the next day I went again to another set of lakes. This time the fish were'skittish' and refused to take the crusts properly until I lowered one into the margin under an overhanging alder tree. The fish (as before) hooked itself and proved to be a nine pound common in fine condition. I went for the camera and found that I'd left it at home so no picture. Not bad at all for 70 pence worth of bread - one lot of sandwiches and two lots of bait.